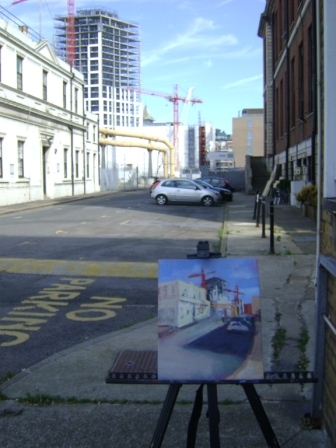 For this year’s Pintar Rápido event in Chelsea, I headed up the King’s Road and crossed over the railway into Michael’s Road, a light industrial area bordering the gasworks/National Grid depot. I was attracted to the two bright yellow gas pipes that wrap around the edge of the site, one above the other. They remind me of those slides that you see in leisure pools. I took a walk around and was asked if I was looking for someone – ‘no, just a good composition’! In the end I settled on a spot that looks towards a construction site with some red cranes. 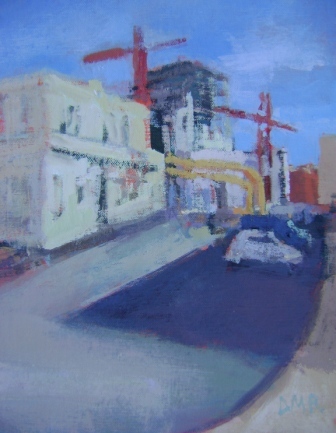 I began by blocking in the dark areas, and the outline of a blue van, which I realised was about to be driven away. Then I gradually added in the brighter areas, layering the colours one at a time. It was baking hot, and my acrylic paint was drying faster than I could mix it on the palette. I spent around 4 hours on this piece, which in hindsight was far too long, as the light and shadow patterns had changed significantly by the end of the session. Painting events are good practice for working fast and making decisions– including when to stop painting! 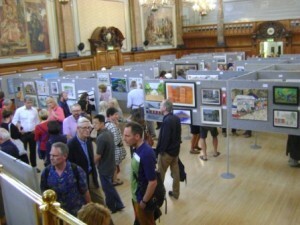 On return to Chelsea Old Town Hall, I framed and submitted the picture for exhibition the next day. I learnt a lot from the event, and picked up some good tips from conversations with other artists. Note to self: take a water bottle with a spray-top next time to keep the palette moist! I just love how you can just ‘throw’ that color down in big swaths and it alwyas is the right value, and in the right exact spot !! amazing ! I wish I didn’t have to change the value once it’s there… that alwyas makes me lose the freshness. I’m not gonna stop trying, though ! !